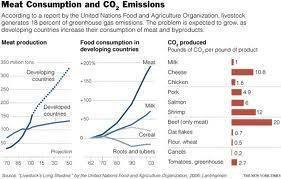 Furthermore eating less meat allows fewer cattle, which is better for the environment. One cow is contaminating up to four times as much as a car, in this case with principally Methane, the second most important gas causing the greenhouse effect. It is however 21 to 25 times more aggressive than Carbon Dioxide, also called Global Warming Potential. When we need to breed fewer cattle, the effect on the environment is huge. LFewerforests will be slashed to convert into pastures, less resources like fuel, gas, soil, water, grains etc will be needed to feed and service the greater live stock. According to the FAO, about 60% of the world’s agricultural land is used for grazing almost 400 million cattle and 600 million smaller ruminants. 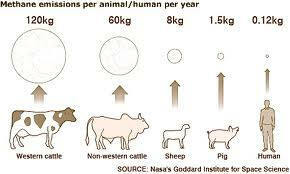 Live stock produces lots of contaminants as ammonia, and the globally affecting greenhouse gases as Carbon Dioxide, Methane and Nitrous Oxide, contributing to global warming. Methane is some 23 times as aggressive as Carbon Dioxide. Not to speak of a secondary pollution by pesticides used on livestock.